I think the pictures speak for themselves… wow! Extreme Dynamic Range Test… Zone 3 – 14! 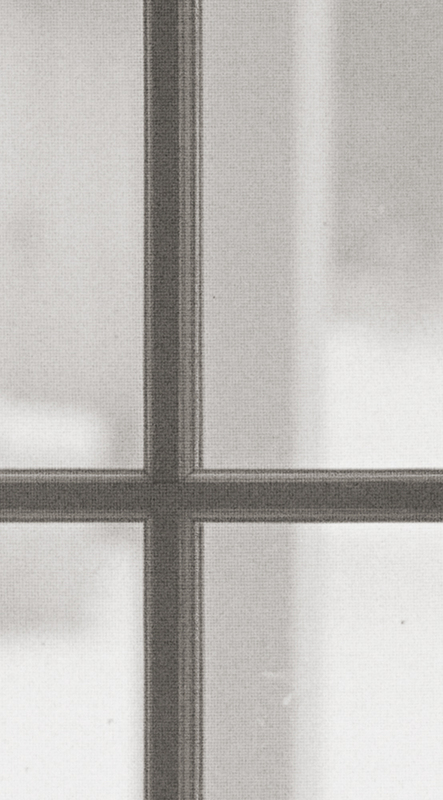 5″ crop from a 30″ print… do you see my dirty windows? 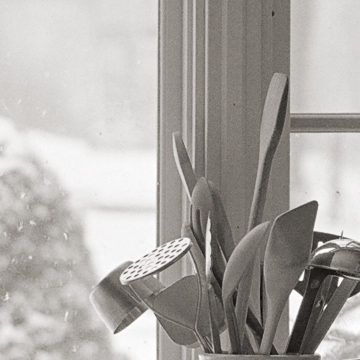 Crop from a 30″ print… do you see the screen? 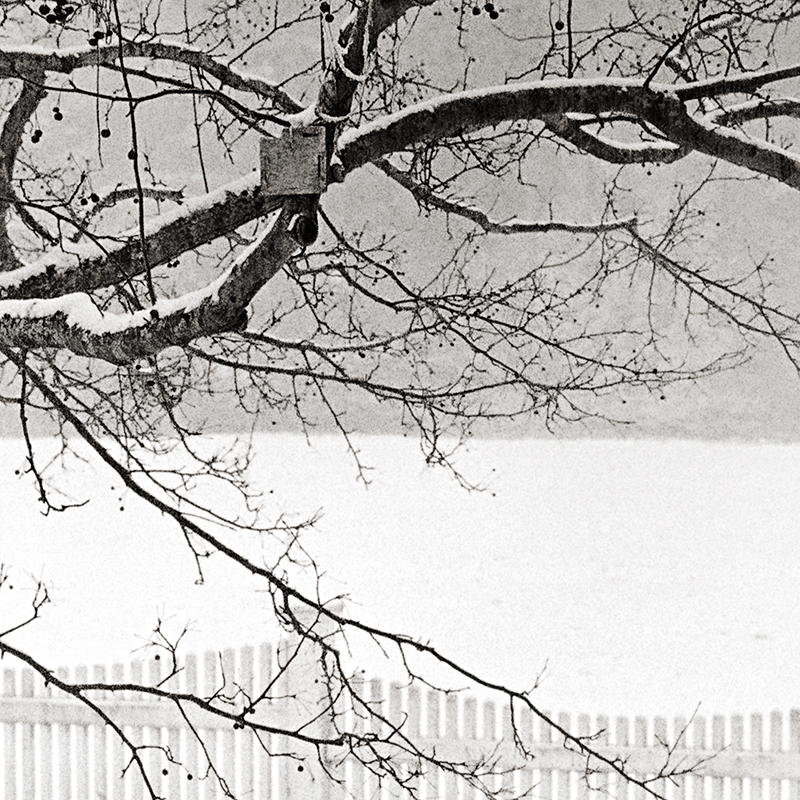 5″ crop from a 30″ print… yes, it is snowing in the image. 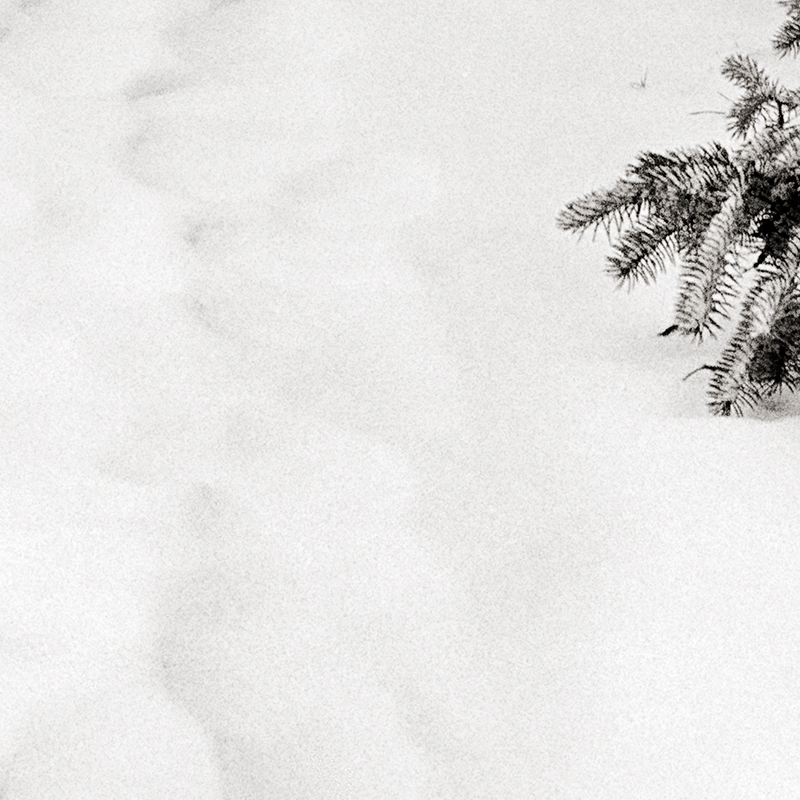 5″ detail crop of a 30″ print… look at the texture in the snow… Zone 8! Both test images were shot on Kodak TMAX 100 at box speed. 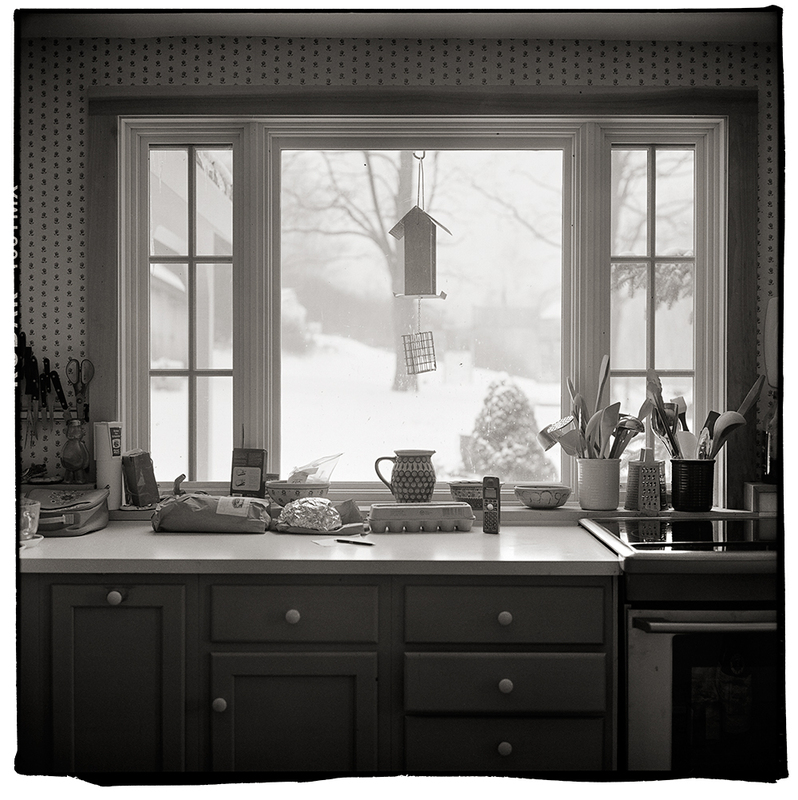 The first test scene was very extreme… Zone 3 on the lower cabinets and the outside snow was Zone 14. The detail images are amazing and I really like how the grain is rendered. 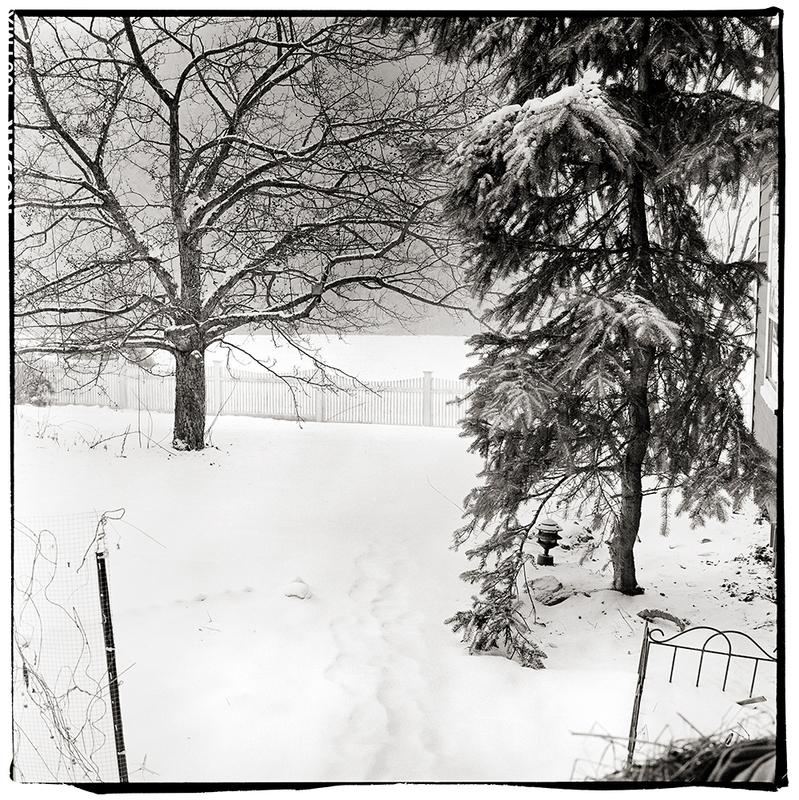 In the second test scene I chose something that had a more “normal” range… deep shadows on the far right bush are Zone 3 and the lightest snow fell on a solid Zone 8… it was snowing during the test shots which is normal for Vermont this time of year, you can see the texture the falling snow makes in the background… the range is quite impressive and very easy to work with. Both scans were straight scans (Imacon) with no sharpening and no noise reduction applied. In Photoshop my standard contrast adjustments were made with little to no effort. In both cases I had more than enough shadow information and a simple “S” curve did the trick… much like I would do with Diafine processed negatives. When I compare these negative to the Fuji Acros negatives I find the Acros is a bit softer and the highlights tend to get very dense whereas the Kodak Tmax 100 negatives are a bit thinner looking but have full shadow detail and very controlled highlight density. The grain on the Tmax 100 in my opinion is a bit sharper than the Acros but both look really nice. Both test images were shot on my 1960 Rollei TLR “F” (120). The first test image was at F5.6 at 1/4 sec and the second image was F11 at 1/30th. How’s that for a great way to start the New Year! I am working on a new book which will outline the technique I use for processing with Caffenol C and also give a starting direction for scanning and Photoshop adjustments to these negatives. I hope to finish sometime this winter so stay tuned. Happy New Year! Very interesting pictures. I also have some to show you when next I am up to good old Vermont. I recently shot some of the new Fuji Acros 100 4×5. I wanted to develop it fast so I just used some hc110. Amazing. I shot some on the 31st and decided to do it at half the strength and twice the time. 9 minutes total. The sharpness and subtle tones blew me away! I scanned it at 4800 optical on an old Microtek Artix M1. I got a file that is huge! I blew it up on screen to over 5 feet on the short side and still no grain and great sharpness. I still intend to sign on with you for a couple of hours of intense instruction. Sorry did not get up again this past summer. My dad passed in late July and I have been putting his affairs in order. My best to you and the family in the new year! Dan- sorry to hear about your Dad… I know how long it can take to get things somewhat organized. Just keep me posted. The forthcoming book is something to look for! Keep us posted. Beautiful tones, and something new to explore! Thanks for sharing these images and info. I, too, look forward to that book. Jesus, that looks cold. It was 70 here today. Interesting technique, and if anyone ever made anything better than coffee I’m not sure what it is. Am digging your site and la revolucion. Vive! But I’m wondering, do you have any tips on getting uniform development? I am consistently getting negatives which are lighter along the center of the strip, and denser towards the edges. This is a problem I have never seen with the commercial developers I have tried. If it matters, this is with 120 film. Oh and good luck with your upcoming book – I look forward to it! Jeff- the uneven development is caused by agitation technique… agitate less and / or with less intensity and that should do the trick. Wow, haven’t check the site for a week or so. I can’t wait for this book! I’ve been wanting to try my hand at caffenol-c development. Your shots are, as always, lovely!